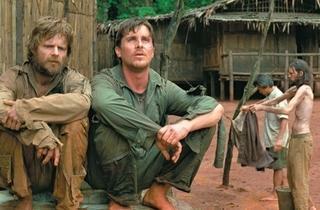 Soldiers of misfortune: Bale, right, and Zahn wait for the right moment. Look past the wildly twitching fingers of Jeremy Davies (how does this actor continue to get work?) and you’ll notice two other men also playing POWs in the Vietnam War film Rescue Dawn. 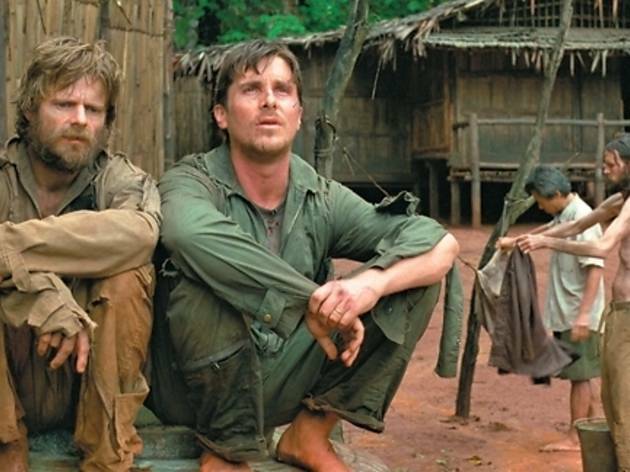 They are Christian Bale, nearly as bone-lean as he was in The Machinist, and Steve Zahn, as fine a supporting actor as there is in Hollywood today. Neither performer is prone to histrionics. But while both sink deeply into their beards and the muck, their eyes shine with opposing points of view. In Bale’s case, it’s undying hope. Zahn registers only despair. Their fierce communion, often expressed in purely visual terms, is remarkable. Director Werner Herzog certainly knows from jungle madness, but even his fans will have to admit he’s repeating himself here: Rescue Dawn is a dramatization of Herzog’s own Little Dieter Needs to Fly, a 1997 documentary about fallen German-American pilot Dieter Dengler (here played by Bale) who made his way out of the swamp by dint of tireless optimism. The doc is more gripping—largely because Herzog’s real-life subject is fascinatingly cracked. But the acting pas de deux on display in Rescue Dawn more than redeems the new movie’s occasional blandness (and odd late-inning jingoism). Herzog has yet to return to the peaks of his ’70s successes, but this brings them to mind.